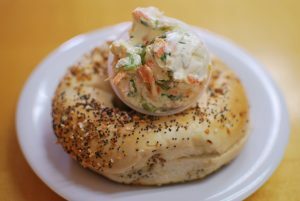 ***** DISH OF THE WEEK (Sunday- 1/20/19- Broadway Bagels). This joint’s bagels absolutely kill! Same for its vegetable cream cheese! ***** Broadway Bagels, 10085 Cleary Boulevard, Plantation, Florida 33324, (954) 424-3905. Long story short, yesterday- Jeff Eats and Mrs. Jeff Eats ate breakfast there and I gotta tell you- it’s too bad that this joint isn’t closer to our Boca Raton home because if it was, we would definitely be real steady customers! You live, you play, you visit anywhere near Broadway Bagels, you try! ***** DISH OF THE WEEK (Sunday- 12/18/16). Simple tale to tell, Broadway Bagels makes absolutely dynamite bagels! That said, yesterday morning’s banana French toast – definitely deserved this Shout-Out! Got a good bagel joint for you guys…Broadway Bagels in Plantation which has been around for something like 33 years. Jeff Eats and a couple of buddies recently ate breakfast there- and I gotta tell you that Broadway Bagels’ deli omelette ($7.99-corned beef/pastrami/Swiss cheese), blueberry pancakes ($6.99) and corned beef hash ($7.99) were all-right on the money! Throw in REAL GOOD sesame, everything and onion bagels- and Jeff Eats would definitely do a second-visit! Just so we are straight with each other, Broadway Bagels isn’t curing cancer or nothing here- the food is good-with its bagels (made the right way- hand rolled/boiled/baked) being the real “keeper” of this tale!-so if you go- don;t forget THE BAGELS! Broadway Bagels is open 7 days a week 6:30am-3pm.